I work with both Google and Apple, and so I get to use both their hardware -- and I'm an opinionated agnostic: I just want things that work well (for me). So the other day I got a Pixelbook on an incredible discount, which Google had someone deliver to my house (same day, with 30 minutes of setup help): an incredible customer experience. As a long time techie, I'm a bit of a power user, and while I've only had the Pixelbook for a little while (iOS for 10 years), my quick assessment is the Pixelbook is better than an iPad but worse than a MacBook, with a ton of caveats. The iPad rules in App selection, single app workflows, as well as consistency with iOS and integration with Apple's other devices and ecosystem. Since I have an iPhone and MacBook Pro, I'll still use the iPad more often. But as soon as you want to work in multi-app workflows, use the keyboard/trackpad, browse or use it as a laptop replacement, the Pixelbook dominates. But if you really want to get work done -- then my MacBook Pro is still my go to device. Apple redefined packaging and how to make a great OOBE (out of the box experience). Their retail stores dominate in customer experience: you can book time, watch trainings, and get help on all sorts of things. I don't like the noise and lines -- but the youthful coffee shop vibe, and helpful expertise raised the bar in the tech industry, and in retail in general. However, others are copying Apple and getting close to or exceeding in what was once a competitive advantage. Microsoft stores aren't as ubiquitous, but are great customer experiences, at least partly because they're so empty half the time that you can actually get on-demand support instead of needing appointments. And everyone has upped their boxing experience to near Apple levels. Google's partnering to hand deliver the device to your home, and help you with setup/conversion, is much better than having to go to the mall and wait in lines. I'm not sure it'll scale -- it has to be less efficient to drive around, and I still needed an appointment... and the guy was an hour late, but he called to warn me first. But he was nice, helpful, and willing to do things like help me re-setup my Google Home which was responding to the "Hey Google" setup for the Pixelbook. He talked about helping iPhone users migrate all their stuff over to Pixel 3's, showed me a few quick tips, and he talked up some other accessories or options. Since I was doing some setup and configuration of my Apps (getting on my corporate network, etc) all on my own, he quickly said that I was past the setup hurdles and bowed out to his next appointment. So a good experience. 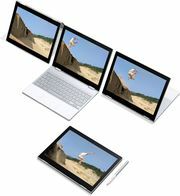 A Pixelbook is an Android Tablet/Laptop Converable. I know they sell it as a Chromebook that runs ChromeOS -- which is really Chrome the browser with some WebApps -- and there are a few Chome Apps in the Chrome Store. But if you're not in education, or some enterprise that's setting up your machine, you probably don't care. A Pixelbook is basically a way to do eMail, run Chrome Browser (and Web Applications), Google Docs, and then some Android Apps for utilities or gaming. If that's all that you do, you're going to love the device -- it is great at it. I put on Office365 and email and can do most of what I need for work. Great for note taking, browsing, office work, and a few games. Done. Android sells more devices both in quantity and variety -- but many of them are down market, to the 3rd world -- which don't pay for software, and are devices you don't want to use. This causes fragmentation (too many device types) and slow adoption of OS updates -- which makes it harder to test software and use the latest OS's, which makes Apps a little less reliable and slower to adopt the latest features on Android. Google Play store has less curation, which means some Apps just work better (like Netflix, Amazon being able to buy Apps/Services inside the App, or Apps like Smart Agents that can help you) -- but other Apps are stale, buggy, privacy/security threats, or flat out malware. Google is cracking down on the latter problems: but it is all after the fact, and it is sort of a game of whack a mole. There are bad Apps, but most won't last too long. So in the end, it's a handful of tradeoffs. I wouldn't say Android is superior or inferior to iOS -- just different. Apple could fix many of their weaknesses, but it's not in their culture or ego to do so. They see their success is because of their quirkiness instead of in-spite of it -- so Apple isn't going to suddenly get less douchey with their App Store rules, or start being more open with their closed little ecosystems (and being a more multi-platform player). Many people buy Android, because they hate Apple. I get that. Of course Google and Microsoft are not without flaws either. But if you hate Apple (or Tim Cook), like OpenSource, and don't mind Google's attitudes against free speech, conservatives or user privacy, then this is a great alternative. If you want to geek around, and configure things, or want a little more freedom than the Apple systems give you, then this is a winner. A Pixelbook's strength is in Apple (iOS's) weaknesses: iOS is a phone OS, and an iPad is still just an iPhone with a bigger screen. It was designed to run a single App that fills the screen. If you're only using one App at a time, iOS still rocks. But Windows, MacOS, Chrome and Android (a bit), were designed to allow multiple Apps to be running in their own Windows or Views. Apple tried to remedy this by copying some of Google or Microsoft's ability to share a screen with two Apps (Split View) -- but iOS is still the worst at it. So you can barely do two-App (or two document) workflows on iOS, and three is a study in frustration and strife. Pixelbook is better at multi-window workflows (though still weak in 3+ Window workflows). The Pixelbook is 2.4 lbs. The iPad Pro is 1.4 lbs... but the keyboard (Folio) is another 1.02 lbs (though Apple intentionally buries that information) -- so in the end, the iPad Pro (12.9") with Keyboard weighs more than the Pixelbook. Yes, if you're using an iPad Pro with just the screen only (no keyboard), then the iPad is better/lighter - and if you're using it only in tablet mode, then the iPad Pro is better. But you can probably buy yourself the cheapest iPad if all you're doing is tablet mode stuff (watching movies or playing a few casual games), people that spend the money on the iPad Pro, are usually getting the keyboard too. The Pixelbook has a better keyboard (and a trackpad), than the crappy keyboard on the iPad Pro, in fact, the Pixelbook keyboard is better than the MacBook Pro keyboard. The keyboard is backlit (helpful in conferences). It also has a trackpad, which is gloriously helpful when typing on some Applications over the iPad Pro requiring you to reach out and touch the screen as a trackpad. Size: the Pixelbook is thinner than an iPad Pro 12.9" (with Folio/Keyboard), but it's like a 1/2" x 1/4" bigger. I find the Pixelbook is slightly better in size/feel. The 10" iPad is of course smaller, and lighter -- but then you get the smaller screen and keyboard -- which is a tradeoff, that I don't make, but others might. The fold over clamshell design of the Pixelbook means it is far more stable feeling on a lap, and far more versatile in positioning. So in watching movies, typing on a lap, or doing things that I do, the Pixelbook clearly feels better. They say they have 4 modes: laptop, tent, display, tablet modes. There are two more useful modes: keyboard and closed. Keyboard mode is like tablet mode, just the keyboard side is up on a desk when you're using it only as a keyboard with an external monitor attached: not a common use-case, but some people like it. You can use the iPad Pro with 2 position laptop mode (no variable positioning), tent mode only precariously works on non-slippery surfaces (so for beds or couches but not airplane trays), there's no display mode, the tablet works better out of the case than folded over, and while you can dock and drive an external monitor with an iPad -- without a trackpad, you need the screen to touch/interact with, so it's near useless. The iPad's magnetic folio holds pretty good, but sometimes falls apart (like when dropped) -- so I find the removability more an annoyance than helpful. Even when sketching, I tend to folk over the keyboard rather than take it out -- otherwise I have to put it back together when done. The Pixelbook has more RAM (8 or 16 versus 2 or 3), similar storage. But it's running Intel Processors versus ARM -- which usually means less battery efficient. Apple and Google both claim 10 hours, but I think Apple is slightly better at getting or exceeding that. The Pixelbook is cheaper than an iPad Pro once fully configured. While they seem close in price, the truth is you can easily get 20-30% discounts on the Pixelbook's (like Black Friday sales) and Apple controls their pricing more. On top of that, for an iPad Pro, you need to add an extra $199 for the keyboard, and a $30 premium over the Google stylus. AppleCare is cheaper than Google's Preferred Care, but it sounds like Google's covers more. Unofficially, I think Apple covers more than they claim to, but it's more hit or miss on that. You can get cellular inside the iPad Pro for $150, while you need to just tether with the Pixelbook. The dual USB-C connectors in the Pixelbook means you can plug in on either side (instead of just one) -- and it's on the keyboard half, instead of the display half -- which is almost always the better placement, in any mode or use-case. Plus that means the Pixelbook can have two external devices (Monitor and Storage). In fact, the Pixelbook even supports external storage -- Apple only unofficially and unreliably supports external storage. The Apple Pencil 2 is magnetic, and charges itself when attached. The Google Pen requires an off the shelf AAA battery, and needs to be replaced yearly. Apple's Pencil is 30% more expensive. ($129 vs $99). Magnetic attachment is also known as unreliable -- it falls off when in a bag. So it is handy when taking a break while working to click it on, but having a case with a loop to hold a pencil is more reliable. Neither the Google Pen or Apple Pencil works with their phones. Grrrr. Both are bulky, and would only occasionally be useful for sketching/doodling... but still. It really matters what you are doing and what your workflow is. If you've got an iPhone, a Mac, and your information is all in iTunes or iCloud, and you're used to Apple's ecosystem, then Apple has closed up their ecosystem enough to make the iPad a better device for you. But only because Apple doesn't play well with others. (They've sort of become the new Microsoft in that regard, while Microsoft has gotten better). Also the Apple variants of ARM processors in their iPad's are really fast and battery efficient in these mobile devices, as well as Apple's superior OS architecture -- means the systems are really snappy. Apple has a lot of top notch games, and all the best paid Apps will be on iOS, well maintained, and take advantage of the latest OS updates and features much quicker than any other platform. Combined with great security, privacy and curation of Apps. If you don't want Google to be selling what you're doing, then this is the way to go. If you don't really care about privacy quite as much, are using the device mostly for browsing, email (Gmail especially), Google Docs or Office 365, G-drive or anything but iCloud, and are using 3rd party web services, or you want to hack, configure or you're doing more keyboard driven things -- then this device is the much better choice. If you just use it as a movie player then a few of the positioning modes make it a lot more convenient. Some Apps can do more things (like purchase inline) because they don't have Apple's more obnoxious App Store curation, but that comes with risks to security/reliability. And you have some added functionality like Google Assistant built in, which can be nice/fun and is more helpful than Siri. You can also get Linux variants running on this (with some hacks) and make it into a more full features laptop. So while my needs puts me more in the second camp, Apple has gotten me locked into their ecosystem pretty well for now -- thus I'll use the Pixelbook as a remote note taking, movie watching, and testing machine more than a replacement for the iPad or MacBook. But I still think the Pixelbook is a better device/form factor -- and if I could hack it to run macOS or iOS, I would. But in the future, WebApps are going to become more and more of the world... and I'll get myself less handcuffed to Apple's ecosystem. And in a world without those handcuffs, hardware is commoditized. And unless Apple is making something like a Pixelbook by then, I'd move over to this as my primary machine in a heartbeat. This page was last edited on 26 January 2019, at 21:37.